The Greens are concerned a new Liberal website is being used to mine people's contact data. This week the government quietly launched its "A PaTH To Jobs" website, spruiking the internship program for young people announced as part of the 2016 Budget. Many business groups have withdrawn their support for the $750 million Prepare-Trial-Hire program — it includes a $4 an hour internship — and employment law experts have called it illegal. The website gives you the option to register your interest in the PaTH program as an employer or job seeker by providing your address, email and phone number, and says the employment minister will contact you with more information. But the website doesn't make it clear in any fine print about who is getting your contact information — the government or the Liberal Party. Is this a website to register interest in a government policy — or a way to mine email addresses for the Liberal party's election campaign? 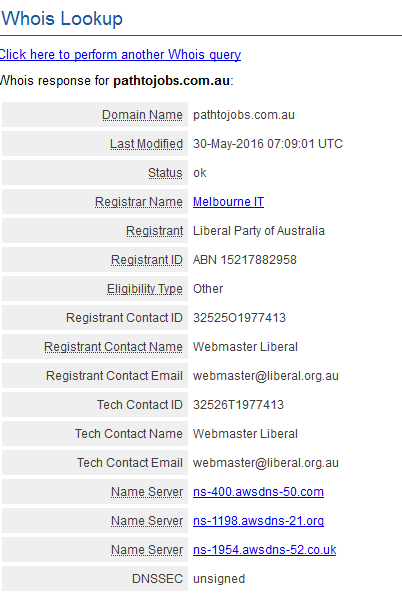 A quick search reveals the domain is owned by the Liberal Party of Australia and is authorised by Liberal Party director Tony Nutt. The Turnbull Coalition election campaign logo is at the head of the website, but the wording mentions the "Turnbull Government" and links to the Liberal party website. The Greens want the government to make it clear how the PaTH to jobs website is storing the contact details and email addresses of people who register interest in the PaTH program. “It is not clear whether the contact details are being stored by the Liberal party,"
WA Greens senator Rachel Siewert told BuzzFeed News. She's worried business owners and young people genuinely interested in the program may not be aware their details might end up on a campaign database. “If in fact the website is harvesting emails for campaign reasons, I think there needs to be transparency around that. This certainly doesn’t pass the pub test," Siewart says. She's urging the employment minister to clarify what the website is intended for, and where the contact information is being stored. Employment minister Michaelia Cash’s office declined to clarify on Wednesday if the Liberal party will keep and use the contact information. On Thursday morning, a privacy clause was added to the PaTH to Jobs website confirming that the information is being collected by the Liberal Party — but, the statement added, they’re doing it on behalf of the Department of Employment not for campaign purposes. 3. The information collected will not be used for any other purpose.